Figure 2-2 shows the governance and management elements involved in developing and executing the integrated NIF Facility Use Plan. A high-level schedule and a plan for the implementation of target shots, laser-science shots, and new capabilities comprise the integrated, multi-mission Facility Use Plan; it is delivered by the LLNL Director to NNSA each fiscal year. Blue boxes in Figure 2-2 indicate management elements associated with NIF. The User Interface box represents the program areas: ICF, HEDSS, DS, and national security other than SSP. The roles of the individuals and committees illustrated in the figure are as follows. Provides management oversight of NIF and ensures appropriate integration of major mission activities consistent with the Laboratory and sponsor strategic direction, user facility best practices, and the Lawrence Livermore National Security contract. 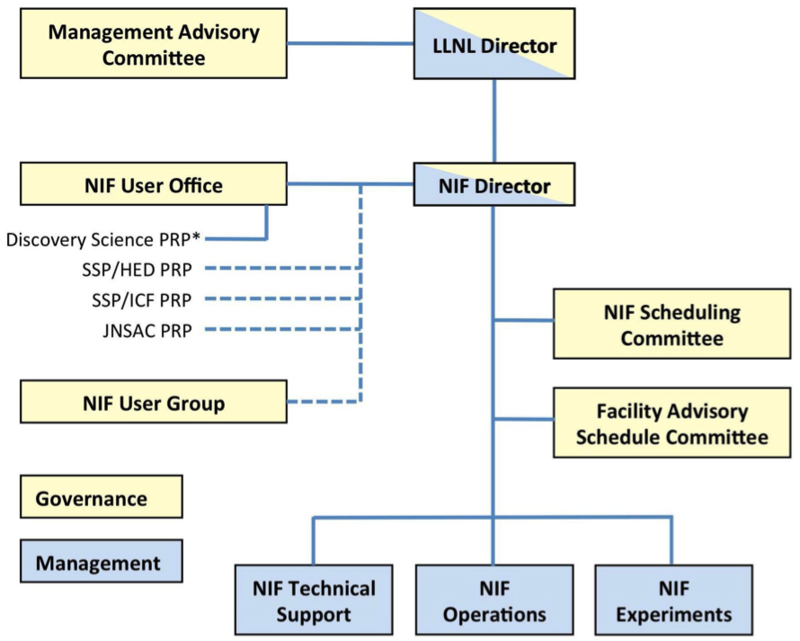 The LLNL Director oversees evaluation of the performance of NIF as a user facility, including evaluation of the NIF Director. The LLNL Director concurs on the NIF annual Facility Use Plan before it is released to the user community. The NIF Director leads and manages NIF as a user facility, implements governance and other management processes needed to support the NIF user community, safely and securely operates the facility, executes experiments, and develops and implements strategies for the evolution of NIF and its capabilities. The NIF Director also ensures that the facility and diagnostic, laser, target, optics, and other technologies are optimized and available to users consistent with available resources and priorities. MAC is appointed and chartered by the LLNL Director and reports to the LLNL Director. It includes the NIF Director (ex officio) senior representatives familiar with NIF missions, and user community stakeholders. MAC provides input to the LLNL and NIF Directors on facility use and strategic direction, and will advise on the appropriately balanced utilization of the facility among missions. It will evaluate the membership and general effectiveness of the Peer Review Panels (PRPs), review the performance of the NIF Director and the performance of the facility on an ongoing basis, and report to the LLNL Director on its status. FASC recommends to the NIF Director system time allocations, promotes an effective user community, and reviews the facility’s overall effectiveness for users. This committee meets twice a year to recommend and approve the baseline schedule for NIF. It includes a representative from each of the NIF programs as well as other stakeholders. The NOM has overall responsibility for activities and operations in the NIF facility buildings (581/582, 682, 683, and 684). This includes being responsible for facility safety and security, managing NIF site access, and being the authorizing individual for facility and experimental operations. The NOM has the responsibility to implement and maintain the Facility Safety Basis for B581, including shot yield management and control and hazardous materials management and control. The User Office Director develops and maintains facility policies regarding governance, data handling, and other user concerns; oversees administrative support of NIF users; and serves as the primary point of contact with the NIF user community. The User Office Director is responsible for ensuring that campaign leaders provide evaluations of facility performance, that the NIF User Office provides facility feedback to campaign leaders, and that the User Office provides a summary of user feedback to NNSA. The NIF User Group is a self-organized group that represents the user community to the NIF Director and other individuals/organizations as appropriate. The NIF User Group has a charter (see Appendix B) and is directed by an executive board that is elected by the community. The members of the executive board serve three-year terms on average. This board is composed of a mix of academic and national laboratory representation. HEDSS, ICF, and NSA PRPs will evaluate proposals based on the proposal team’s likelihood of achieving the defined scientific, technical, and programmatic objectives. The NSA PRP provides recommendations to the Joint National Security Applications Council (JNSAC) and the sponsors of individual proposals. The DS PRP will evaluate proposals based on scientific merit. PRPs may meet jointly as needed. PRP recommendations are provided to the NIF Director and program leadership and are used by the NIF Director in developing a recommended multi-mission Facility Use Plan. NSC develops and maintains the NIF schedule following the guidelines of the approved NIF Facility Use Plan. The NSC plans an optimized use of the facility by grouping shots with like diagnostic configurations. It manages changes to the NIF schedule through the SCR process and produces the baseline detailed shot schedule for two quarters of the fiscal year a minimum of six months ahead of the start of that period. The NSC baseline schedule is reviewed and approved by the FASC before being forwarded to the NIF Director for acceptance and implementation. The NIF Technical Support, NIF Operations, and NIF Experiments groups are the management elements that maintain NIF as a world-class HED research facility, operate the facility in support of all missions, and support the NIF Director in formulating and executing the NIF multi-mission Facility Use Plan. These groups also support PRPs in reviewing user proposals from the facility perspective.